A systems model of how ethnic tensions flare into violence has passed a test in Switzerland, where harmony prevails except for one region flagged by the analysis. The model runs census data through an assembly line of high-powered mathematical processes, but at its root is one basic assumption: that community-level violence is primarily a function of geography, modulated by the overlap of political, topographical and ethnic borders. 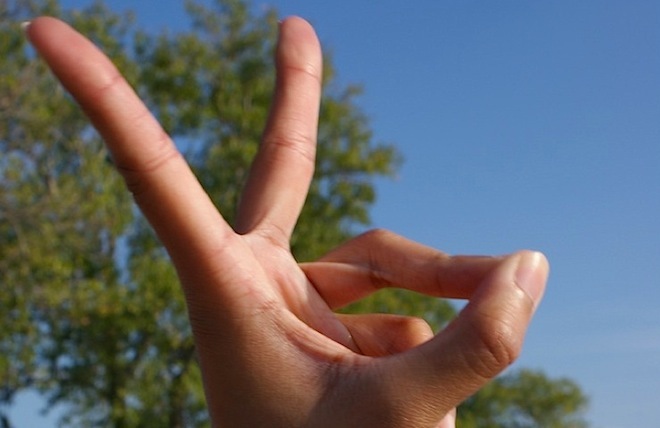 Though tests of the model, developed by network theorists at the New England Complex Systems Institute, are still in early stages — Switzerland is the third country to be analyzed — they raise the alluring possibility that propensities to social violence can be formally quantified, predicted and even prevented. According to Bar-Yam’s team, between-group violence is unlikely when one of two conditions are met: Either diverse communities are so well-integrated as to prevent any one group from dominating, or — lacking such integration — when political or geographic boundaries match demographic borders. When there’s a mismatch, tendencies to persecution have opportunity to flourish. Majority groups have the power to define local rules, but minority groups are large enough for conflicts to arise. With the right borders, this wouldn’t happen. “Violence arises due to the structure of boundaries between groups rather than as a result of inherent conflicts between the groups themselves,” write Bar-Yam’s team in their Switzerland study, released Oct. 6 in arXiv. The claim sounds suspiciously reductionist, with complicated social realities subjugated to a few neat parameters. But as demonstrated in the 2007 Science paper where NECSI debuted the model, its calculated local probabilities of violence closely matched the locations of real-world violence in Yugoslavia and India. 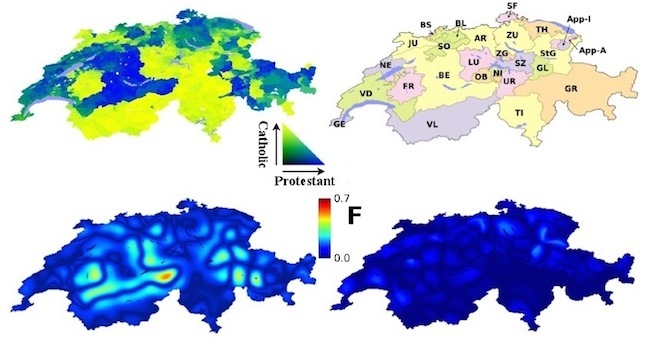 In the new study, they test the model with data from Switzerland, a country known for social stability and prosperity, but containing a potentially volatile cultural mix of different languages and religions — French and Italian and German, Catholic and Protestant. The researchers mapped census information onto a spatial grid, then categorized the patchwork of ethnicities with refined versions of equations typically used to define edges and borders in artificial vision applications. 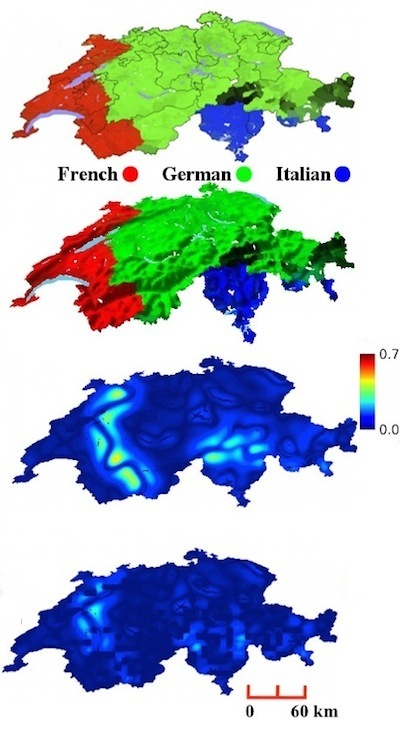 That produced a baseline map of violence risks, which was then cross-referenced with maps of Switzerland’s cantons, or quasi-autonomous member states, and maps of mountains and lakes. Heightened risks of violence occasioned by religious differences were smoothed out by the inclusion of borders. “Switzerland could have been Northern Ireland, except they made canton,” said Bar-Yam. For linguistic differences, heightened risks of violence persisted only in the northwest, where the Jura mountains form a porous boundary between historically French and German-speaking communities. As predicted by the model, this is indeed a region where violence erupted in the 1970s.